First the immediate resources then whips and chops. We'll see if there's anything to do with the surrounding terrain ... so far it looks as though I may need to go off-shore to the NW. Last edited by Beorn; 27-02-2019 at 16:21. 2 fishes, only one of which I can reasonably reach. This dot or 1 below. Probably 1 below, best get food first, and an extra flood plain, then whip a monument. 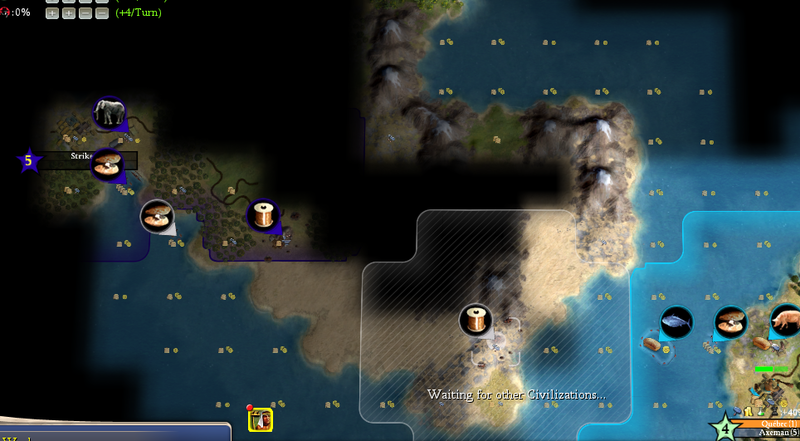 Then further down, the black dot for the black sheep: 2 good 5F tiles, 2 good hills, more bad hills and tundra. 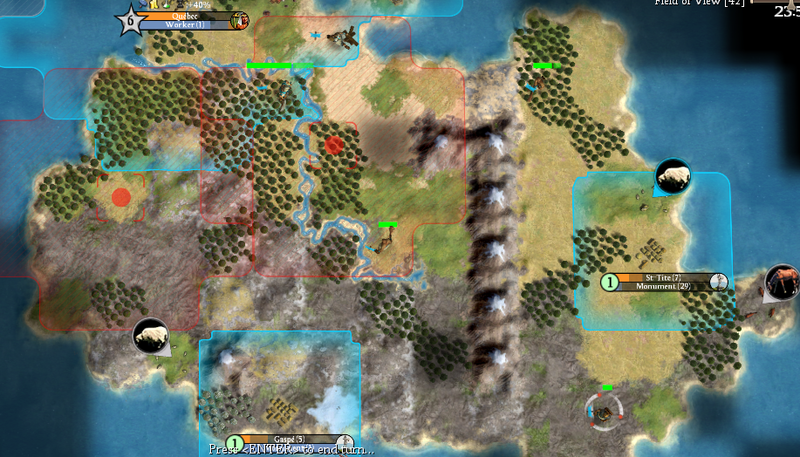 Will be a serviceable military port. Lots of nothing to do, first pig online. Wolves, sheep, a shephard. Suspense and a children's fable on the east coast. Many of them are cramped together while I'm on an isolated island. Horses are in, off to the east coast with sheep. Both of my pigs are online and clams will be up right on cue for size 3. 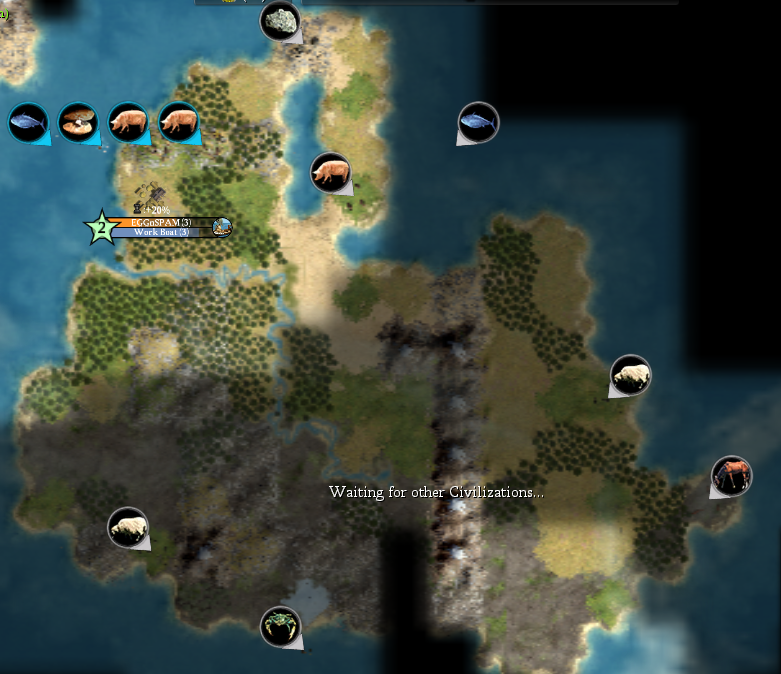 Between that, the isolation and tons of chops, I should be able to set up a nice runaway empire with a minimal archer contingent. There's 5 solid cities as is, maybe 6-7 if copper or iron demands it. However, Immortals will be all but useless. We'll also need early galleys for the circumnav bonus. 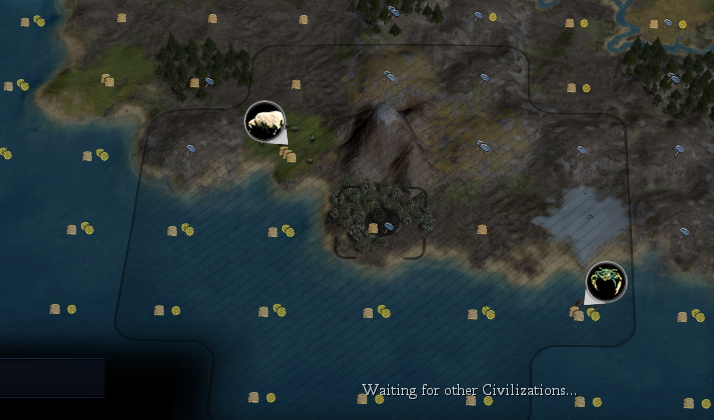 I need to brush up on coastal wonders and trade route commerce. Looks like it'll be my economic base. The cat's out of the bag: I got to slavery first. 4 food resources weren't enough though. 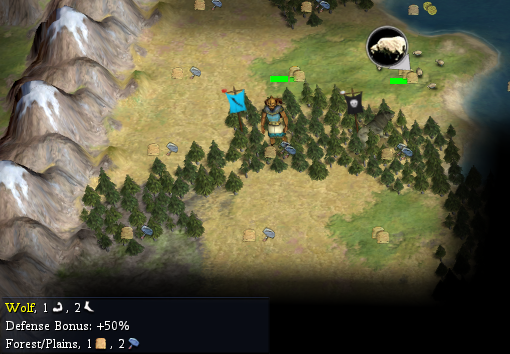 With copper right in the fat 12, I'll be able to build a massive army of axemen FAST to kill ALL THE WOLVES. Whipping from settlers is key, as I've got a 50% production advantage on them. Secondary sites will have to spam workers and cottages. 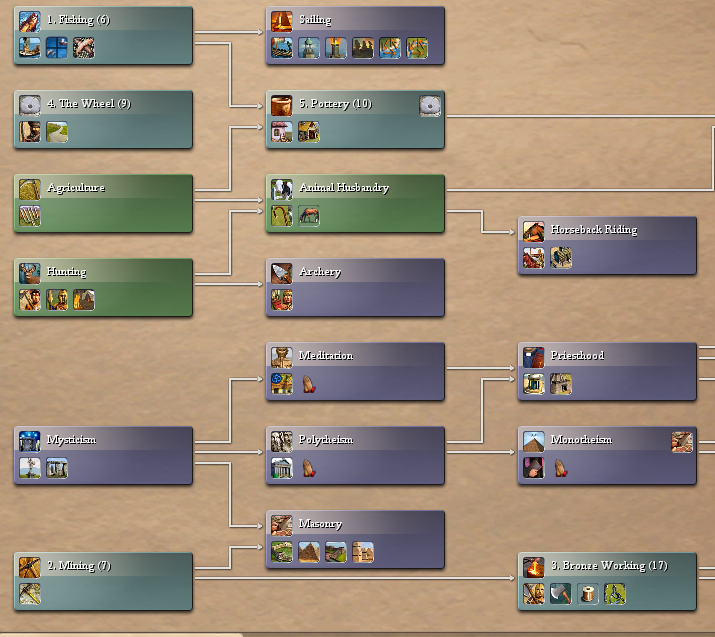 Starting from isolation and without tech trading, REX into a cottage and trade route economy has a lot of potential. No need to mass forces yet. Or to claim territory. Stonehenge is thus a bust. Gotta shoot for a fast economic expansion to every workable tile, with GLH/Col support. Unemployed fishermen from Québec have met with foreign scouts and requested to see their women. Being poor and without work prospect, they bet everything on cultivating a foreign aura of mystery. Maarten of the Stralish, scoreboard leader and religious guru, has appeared on the landmass to the NW. That's slightly concerning, in a way. A life of cottage greed without enemies was a treasure to be relished. On the bright side, there are no luxuries on my landmass so meeting new folks will allow for better trade routes and luxuries. Knowing that they've talked about being all piled up together, there's no doubt in my mind that we'll be able to work out some competitive deals. Side note: scouts don't count as city garrison for happiness purposes. Cottages and sea exploitation remain on the menu as coin is the only way I can pay them. Thing just got more interesting. Ynnek and I are both whipping. 1 pop for him, 3rd for me. 3rd settler is out. The landmass to the NW is barren, with desert and mountain peaks. That gives me hope I'll be able to settle on the one copper hill so as to establish a coastal beachhead with both strategic interest as a defensive buffer and little risk it will be envied for its productivity. The capital city was named EGGnSPAM. While BakedBeans made for a suitable second, the persians will be hard-pressed to keep naming cities like that forever. Thus, I'll be picking from the list of towns in Québec. Québec and Lévis are the 2 first offerings, with Gaspé to come on the south shore and St-Tite far to the east to claim horsies. From our beginnings as insular, isolated idealism shall rise patriotic nationalism through such naming strategies. Or the english canadians will send troops in to quell our hopes. Coin flip really. Last edited by Beorn; 30-03-2019 at 18:23. 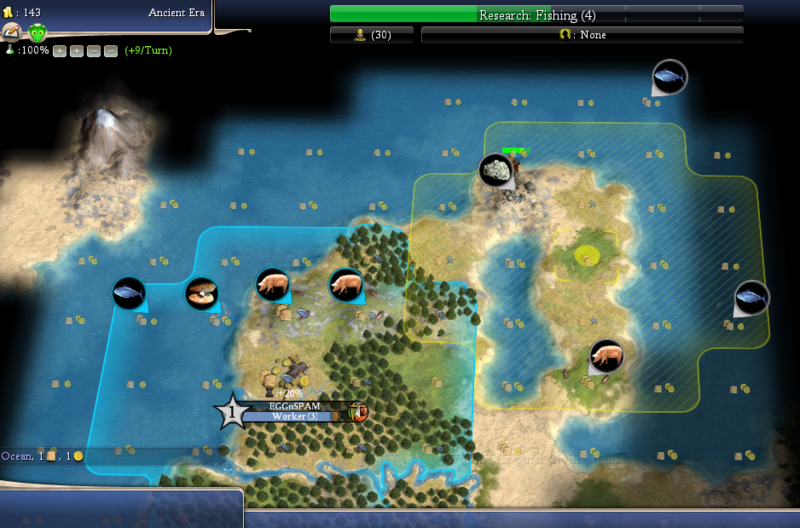 Napoleon has a coastal capital which will be good for trade route commerce. 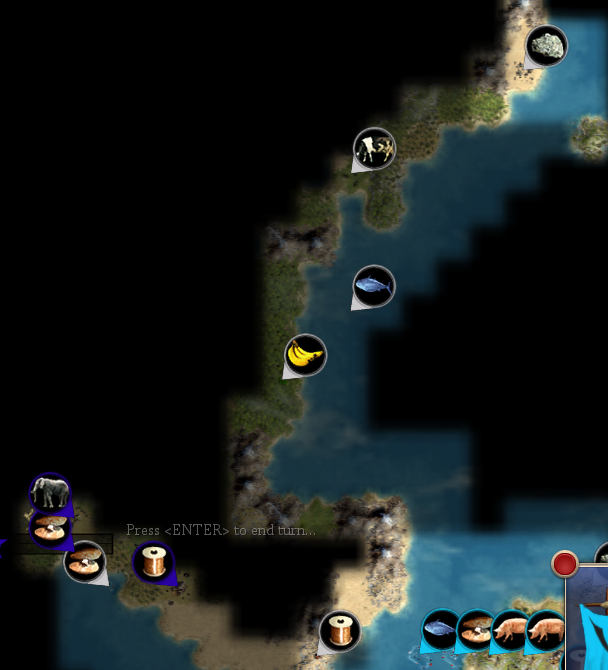 Unfortunately, it's bad for exploration. Misclicked the scout that was protecting my 2nd settler. There's a tiny chance that a wolf or jag would pop out of the bushes and take him. That sort of national tragedy would bum me out but oh well. Pictures with city #3 soon. Further north: jungle and a warrior from Matrix. Killer (France) might be willing to let me settle that copper. We'll see. Either way, it's super low priority for him as he's got copper already connected in city #2 and the terrain around that copper is dreary. My priority is spamming up cottages and putting together a navy of triremes. Isolation has its perks and I'll bet they can't afford to put up a navy on top of the tug-of-war of land disputes. Settler #4 is almost on the horse site. The fogbusting scout defended against a barb warrior, which is an unexpected surprise. 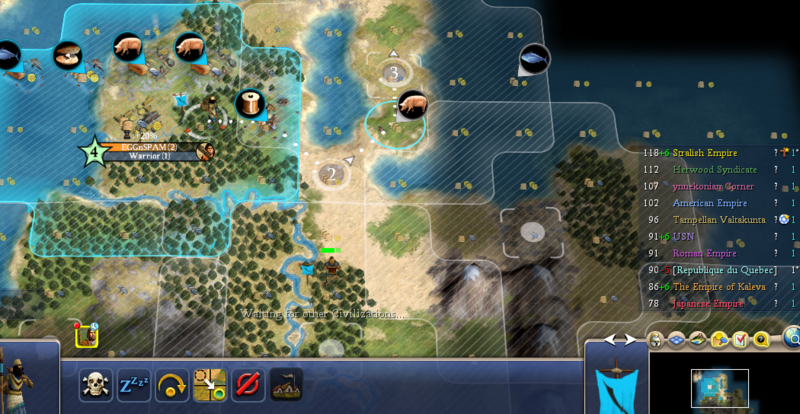 I need more workers to start spamming cottages but at the same time, quick and dirty imperialistic+chop+whip settlers will fill my island so fast it's almost worth foregoing workers in many places. Maarten has upped his espionage game against me. From his score, he went tall. Probably has luxuries. I bet he's going big on spies against me because I'm out of reach of his scouts and he wants to know what he's up against. They'll need open borders and spare ships to even think about scouting me. Killer is either preoccupied with a closer neighbor, or surrounded by too many people, or both. I'll have demographics on him soon. Last edited by Beorn; 12-04-2019 at 18:06. Demographics reveal I'm first in crop yield. That's awesome. I may have limited bonus resources and NO luxes, but going wide and planting cottages will keep me in the game. 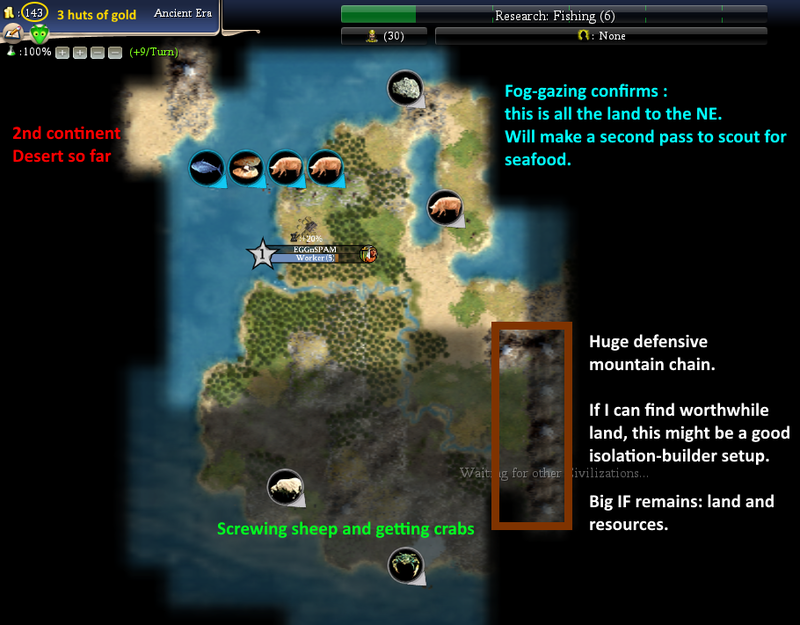 There's plenty of strategic resources. Plenty. With no one to immortal rush. All of my resources are now settled and pending exploitation. There are 2 more good spots for cottages inland - with settlers about to be chop+whipped. The foreign situation is very quiet. No one on the east coast, just untamed jungle. Killer has been out of reach and/or unresponsive, although he did accept open borders. 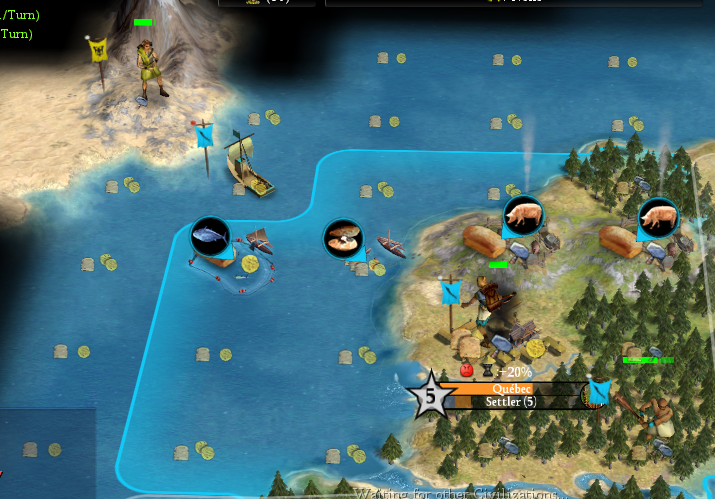 Sailing next turn will give me some juicy trade route gold from him. I'll have an axe and a scout in his backyard sooner rather than later. I hope we can cooperate. He has defensible land that would be a PITA to conquer from a naval transit and his best interest would surely be to keep his sights on the NW neighbors that are running away in score. Last edited by Beorn; 16-04-2019 at 21:21.